Rainwater is arguably the best source of alternative water for achieving your BASIX (Building Sustainability Index) water target. It is recognised by the NSW government as being an important source of water sustainability. You will need to provide the size of the roof area diverted to your rainwater tank. This area is measured in the horizontal plane and should include all non-trafficable roof surfaces measured to the outside of the gutters. If you have a stormwater tank then trafficable areas can also be claimed as your catchment, including gardens, lawns and planter boxes. You will need to specify in total litres the size of the rainwater tank/s and stormwater tank/s that you will be installing on your property. If your local council requires water storage for fire fighting, this capacity cannot be included in the BASIX total. If you have mains water topping up your tank water, they should to be installed 300mm from the base of your tank. If you need a higher top up level then it should be noted. You will need to indicate if the overflow of your rainwater tank is diverted to a stormwater tank. As rainwater tanks can overflow during heavy downpours, rather than waste this water, you can configure your tank to divert the overflow into another tank. This can be a stormwater tank (which allows you to also capture water from ground runoff) or even a second rainwater tank. 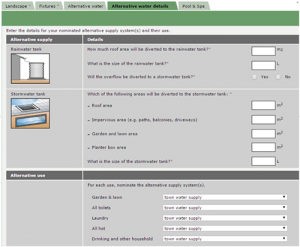 You will be assessed on how you will use your stored rainwater throughout your home. Rainwater is very versatile so can be used in all areas – garden and lawn, toilets, washing clothes, hot water system, pool, drinking and all other household uses. While NSW Health does not recommend the use of rainwater for drinking purposes where a reticulated potable water supply is available, in rural Australia rainwater tanks are widely used as a safe source of drinking water. As long as your rainwater tank is made from food-grade materials and it is properly maintained to protect water quality, then there is no reason why you and your family cannot enjoy safe and fresh non-fluoridated rainwater. For more information, see Is It Safe To Drink Rainwater From Water Tanks?. If this article has helped you, then why not contact National Poly Industries today. We can help you achieve the BASIX water targets for your new home by recommending economical water storage solutions suitable for your needs.